Come stay with us on your next trip to Ashland, Oregon. Home to the Oregon Shakespeare Festival. Southern Oregon is known for its natural beauty, cultural activities and many outdoor adventures. Keywords: Log Cabin Lodge on the shores of Hyatt Lake. 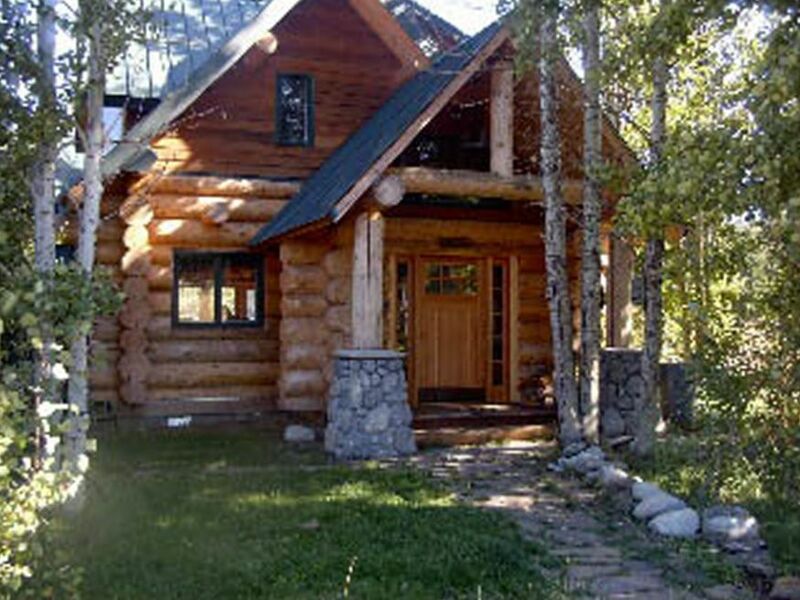 Secluded and nestled in an alpine meadow surrounded by Aspen trees. Majestic, serene , private and great views. This is not really me but it is my son. It was such a great fish that I had to show it . I was born in Ashland in 1951. My grandfather used to bring me to Hyatt lake every summer for a week of camping and fishing. When I was on one of my bike rides from Ashland I noticed a for sale sign in the grass that appeared to have been there for a long time. I jotted the number down and thought what a great place this would be should it still be for sale . As fate would have it it was . After many years of remodeling rebuilding etc. I thought what a sham that more people don't get to experience Hyatt lake as I did growing up. That is why we offer this experience for you, your family and friends. It offers so much to do and is a great escape from the heat of the valley in the summer months. The cross country skiing , hiking, biking and just the remote feeling of its location . Its 1/2 mile from the Pacific Crest Trail. Rest and relaxation. A great place with clean air and water. Don't bring bottled water , as the water in the tap is as good as it gets. Watch the sunrise over the lake while having your morning coffee on the deck . Sit by the fire pit and stargaze. Go for a canoe ride on the lake. It doesn't get much better than this. Don't forget your bike. Great area for both mountain and road bikes. For those wanting to see Crater Lake, there is a back route taking you into the East entrance. It's a drive you won't want to miss. If you are into bird watching, my biology professor counted 210 different species of birds from the front deck. Newly installed floor heat thru out the main level as well as propane heater. We supply all bedding . We supply the wood, more can be purchased at the Howard Prairie resort. Please follow all fire regs with the outside pit. Forest Service will fine you if your burning outside during fire season. We have plenty for 6 cars. Through our cell company , limited usage for emails only , additional charges will be assed if used for movies and games. Fully stocked with pots & pans, coffee maker, spices, utensils, dishes, blender, toaster, and much more. Large flat screen TV with Dish cable. We offer a few historical books and fly fishing books. We no longer allowed to supply canoes , insurance has made us stop but feel free to bring your own . large deck looking at the lake with dinning table . One step into the main level of the cabin . The edge of the lake changes depending upon the time of the year and how much rain the season has had. There is a horseshoe pit, and a volleyball net with a volleyball provided. A great site seeing drive to Crater lake thru the Klamath lake basin, One of our favorite dinning places is on the way with lakeside dinning on the Klamath . This drive should not be missed . It takes you into Crater Lake the back way.